The artist who created the album cover for The Beatles' Sgt Pepper album has been given a top honour in the band's home city. 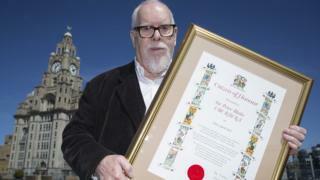 Sir Peter Blake received Liverpool's Citizen of Honour at a ceremony at the city's Liver building. The 84-year-old also gave Mersey ferry Snowdrop a dazzle ship makeover entitled Everybody Razzle Dazzle. Sir Peter, who was born in Kent, said he hopes Liverpool people will accept him as an "honorary Scouser". Lord Mayor of Liverpool Roz Gladden said: "Sir Peter has helped shape Liverpool's cultural significance on the global stage for more than five decades - from Sgt Pepper to Everybody Razzle Dazzle. "His work with The Beatles was one of the seminal moments in popular art in the 20th Century and 50 years on still resonates around the world as we will see with our 50 Summers of Love programme." She said he had continued to make outstanding contributions to the cultural life of the city "underlining the depth of feeling he has for Liverpool and the city has for him". Image caption Sir Peter said he treasures "the warmth and good humour of the people of Liverpool"
Sir Peter said: "As well as my music links with the city, I'm proud of my association with Liverpool Biennial and Tate Liverpool and hope to continue my relationship with the city." He said he treasures "the warmth and good humour of the people of Liverpool". Citizen of Honour awards were introduced in 2008 to recognise individuals who have enriched the image of Liverpool and its citizens. Recent recipients include James Barton, founder of the nightclub brand Cream, and Harry Potter and Fantastic Beasts film director David Yates. The Snowdrop ferry was due to be returned to its original paintwork at the end of 2016 but it has been extended until 2019.